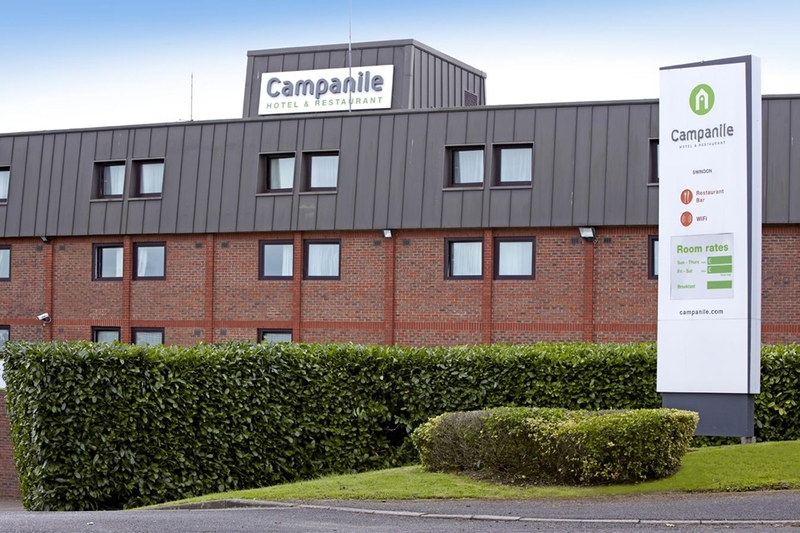 The Campanile Swindon Bed and Breakfast hotel is ideally located in a quiet business park, just 5 minutes from Junction 16 of the M4 and 2 miles from the town centre. It is an ideal location for business and leisure use with the Outlets Village just 2 miles from the hotel accomodation and various others outlets close by including car dealerships. Swindon offer attractions like The Steam Railway Museum and Butterfly world. Cotswold Wildlife Park and Longleaf Park are only a few miles from Swindon. The Campanile Swindon B&B Hotel was fully refurbished in 2008 to the NG standard. All our 120 rooms have been fitted with comfy Hypnos beds, flat screen TVs, hair dryer and courtesy trays with Tea and Coffee facilities which are refreshed every day. WIFI is available throughout the hotel, charges apply. All our bathrooms are fitted with shower and baths. 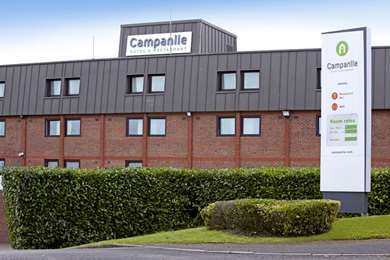 The restaurant at Campanile Hotel Swindon offers a self service starter and dessert buffet and a range from the "A La Carte" menu and also the daily Chef’s Special. Full English and Continental breakfast are served daily at an extra cost: fresh fruits, yoghurts, cereals, croissants, cooked meat, selection of teas and coffee. The hotel offers 3 conference rooms which can open up to provide one large room, a flexible space to suit your requirements from 2 to a maximum of 150 persons. We cater for small business meetings as well as wedding and parties. WIFI is available within the 3 rooms (charges apply), free use of LCD projector and screen in the room. We also offer a choice of menu and coffee breaks which suit your needs. The hotel has 3 conference rooms which can welcome from 2 guests to 150 guests for special events like parties and weddings. The Campanile Swindon B&B Hotel offers 120 rooms: 80 doubles for single occupancy and 40 twin rooms. All our rooms are equipped of paying WIFI, flat screen TV with various channels, hairdryer, teas and coffee facilities refreshed everyday, comfy Hypnos beds, desk and chair. The hotel has easy access at the bar and restaurant and disabled parking spaces near the hotel entrance. 2 rooms are situated on the ground floor. From 6:30 am to 11am (and from 8am to 12pm on Saturdays-Sundays & Public holidays),top up on vitamins in the morning with our all-you-can-eat Continental buffet : fresh fruits, yoghurts, cereals, pastries, cheese, ham, fruit juices and a selection of teas and coffees; in addition to traditional cooked breakfast. If you’re looking for somewhere to chill out, after a hard day’s work, why not relax with a bottle of wine or a beer? If it’s sports you’re into, then, join us in selected destinations. By day, you can relax with a pint and enjoy the days sporting events; by night and come the weekend, you can feel the passion, with rugby and football fixtures. From M4, exit junction 16, take A3102 to Swindon. At 2nd roundabout go straight on Great Western Way. Take 2nd slip road Welton Road into Delta Business Park. Turn left and follow road to hotel.